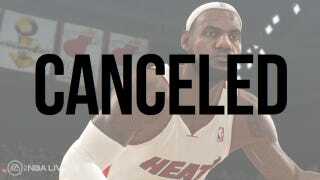 EA Sports today canceled its troubled NBA Live 13 project. It is the second time in three years that sports video gaming's dominant publisher has pulled the plug on its NBA simulation at the last minute. Andrew Wilson, the executive vice president in charge of the label, announced the decision in a statement posted to NBA Live's official site. "Having continued to look at the game over the past few days, it's clear that we won't be ready in October," Wilson said. "And rather than launch midway through the season, we're going to sit out the full year and stay focused on making next year's game great." An EA Sports spokesman confirmed to Kotaku that this is not the cancellation of the entire series, just this edition. Asked if any changes would be made to the leadership of the development team, the spokesman said the label had no announcements to make regarding staffing, and declined all further comment. "I'm disappointed that we have not yet met our high expectations with NBA Live, but I remain motivated about where we're going," Wilson said. "We're committed to delivering new innovation in online, and our progress in the visual presentation of the game continues to take big strides. We also know that a great game starts with great gameplay, and this remains a huge priority for us." The entire text of his statement may be read here. It is unclear what exactly tanked NBA Live 13, which showed some promise as a work-in-progress and then fell flat on its face in a hands-off demonstration at E3 that seemed only to spotlight poor visuals and broken player AI. An advisory council of gamers, some of them already aligned with EA Sports through its "GameChangers" outreach program, repeatedly blasted the game's poor quality in private demonstrations, at Los Angeles and in Florida. Many were said to recommend EA not ship the product. It is a colossal failure, and almost unimaginable that a publisher of EA Sports' size would twice fail to ship a product, much less one with this kind of visibility and licensing, especially given what happened two years ago. The franchise tried in 2010 to reinvent itself as NBA Elite 11, only to be pulled back one week before release over quality concerns, highlighted particularly by embarrassing glitches discovered in the game's demo version. The game was then taken from its EA Canada home and given to an entirely new design team at EA Tiburon. Though NBA Live was last on shelves in 2009, the creative leadership repeatedly stressed that NBA Live 13 was not a three-year project. Much of 2011 was spent analyzing the remains of NBA Elite and seeing what was usable. NBA Live 13's development staff of 80 was not fully hired until about this time last year. Even so, sports video games are built on an annual cycle, and this one failed to arrive complete in the year it was given, for the second time. A spokesman was asked exactly what sapped development time and momentum from NBA Live 13. Again, he did not comment, other than to say EA Sports planned to publish this work as NBA Live 14 next year. But any trust this game had left with the sports video gaming community is shattered, if not irrevocably, then it will require a herculean effort to rebuild it, with a game of surprising and undeniable quality. Considering this is up against 2K Sports' NBA 2K series, an annual contender for sports game-of-the-year honors, that seems like a very, very long shot. Rumors this summer suggested that NBA Live 13 would have been a digital only release, almost certainly for a lower price than the $59.99 standard to Xbox 360 and PlayStation 3 releases. EA Sports "delayed" the game on Sept. 13, although the label noted that NBA Live 13 had never gotten a release date. Now it never will.